It is an inward body curve at the lower back waist above the posterior. If your pattern pools and wrinkles across back below the waistline. MELODY NOTE: Alterations and pattern adjustments work like this: head to toe or top to bottom; basically bodice to skirt if you will. 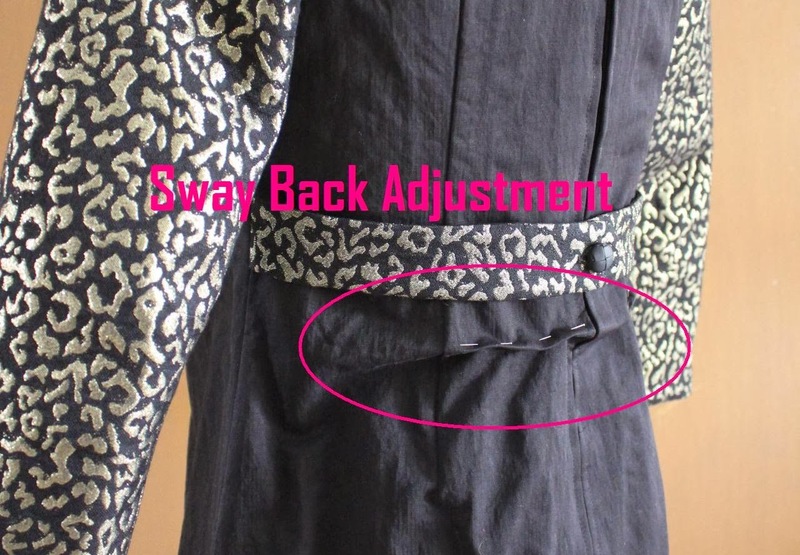 So... the sway back adjustment in a dress back block is a skirt (bottom) adjustment. Therefor all bodice (upper) adjustments must be made first. Why? The way a garment hangs and/or is adjusted across the shoulders, back or bust will in turn affect the pooling and wrinkles located at the lower center back. Dress blocks do not have waistline seams, the bodice and skirt back are one piece. The sway back adjustment happens where the waistline falls on the block. For this pattern adjustment I am demonstrating on the Simplicity 3833 shift dress back pattern piece but the adjustment method will apply to any dress back block. A dress block has no waistline seam, the bodice and skirt back are one piece. At the center back measure from the pin to the folded edge of the pinch. The pinched fabric is a fold (2 plys) of excess fabric. You must double your measurement to get your sway back adjustment measurement. 1. 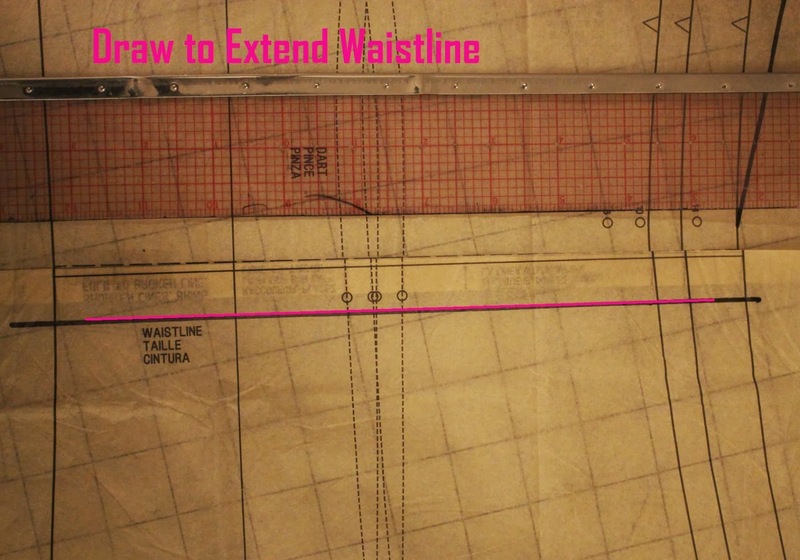 Draw a line to extend waistline across dress back, from the center back through side seam. At the center back seam measure down from the drawn waistline line the distance of your sway back measurement and draw a little line. 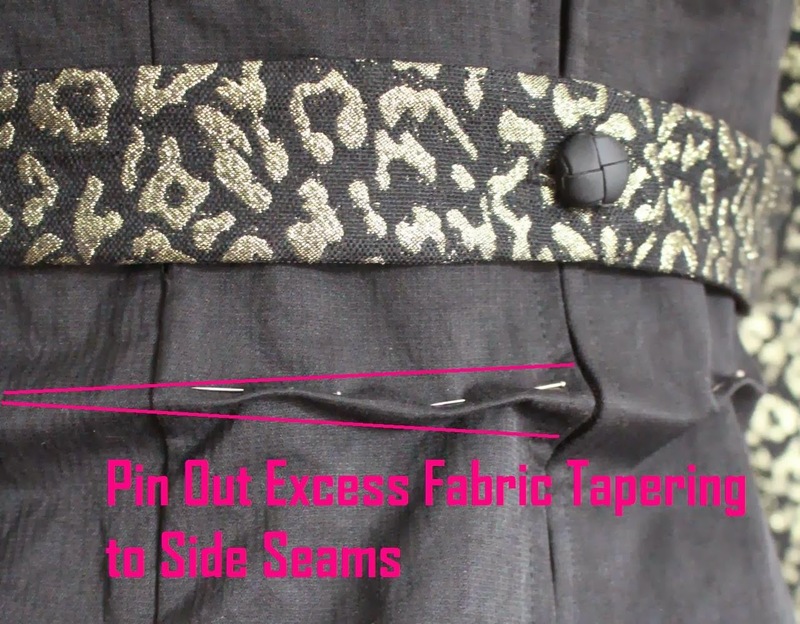 Cut at the drawn waistline line through the center back seam to the pivot point. From the side seam clip to the pivot point to form hinge. 4. Slide the cut waistline down at the center back to the little line, keeping the pivot hinge intact and allowed to open. Tape to secure. 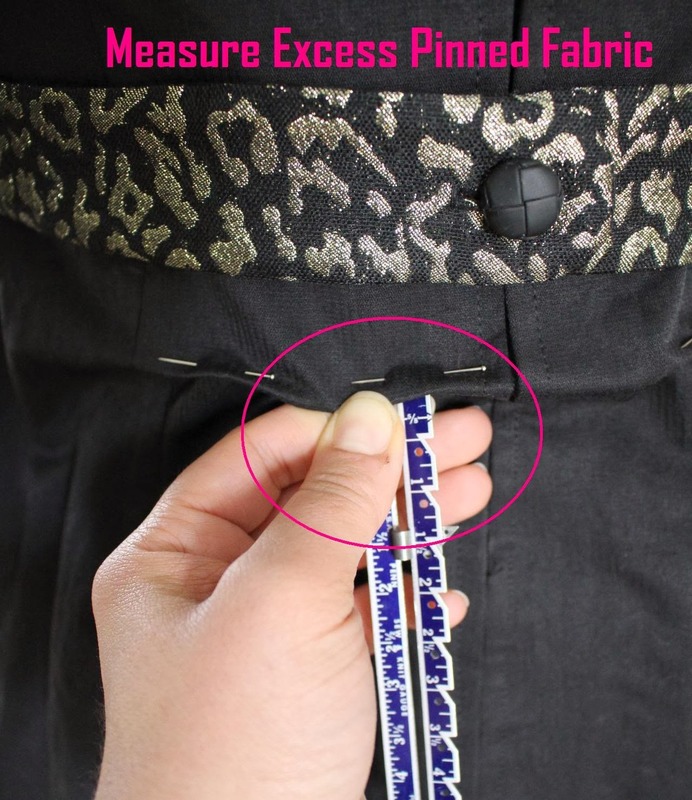 Adjusting the skirt at the waistline affects the hemline (top to bottom... see MELODY NOTE above). Wedging out the excess fabric at the center back waistline in the sway back adjustment will also cause the hemline to wedge up. Therefor the next step is to correct this swoop at the hem by adding the wedge back to the center back of the hemline. At the center back seam measure down from the hemline the distance of your sway back measurement and draw a little line. Use a curve to connect new lowered center back drawn hemline line to the hemline at the side seam on the back piece. If your bodice back block has fish-eye darts - check to make sure that the darts are still parallel to the center back seam. If the sway back adjustment has caused the skirt ends of the dart to shift you will need to realign that end of the dart. Thanks for an excellent tutorial, this will be so helpful. Wonderful, I am glad it is helpful! Thank you for this post!!!!! Thank you so much! Vanessa you are so welcome. Please let me know if you have any questions about the adjustment, hope it helps! This is great post, I love construction tutorials like this! Thank you Siri, it is good to know. I too love tutorials; you never know when you may encounter and use some of those collected sewing skills! This is the first adjustment tutorial I've read that made sense to me -- I need the step by step instructions plus the pictures. Thank you and forgive a stupid/lazy question: have you also done a full bust tutorial? If so, I'll find it and if not, then I implore you to write one. I am very happy it is clear. I have not doe a FBA tutorial, but I will put it on my radar to do one! Thank you! Thank you for this post! My swayback measures an astonishing 4+ inches and I"ve been looking for a way to do it without making a centre back seam. I can't wait to try this method. What do you do if your back piece is cut on a fold (like a blouse)? It looks like the center seam on your dress is no longer straight. In this case my CB is a seam so the curveature remains. In your case of a CB on the fold you will need to redraw the CB for a straight fold.